When you’re a beginner bot builder, learning about natural language understanding, conversation flows and messaging platforms can feel a bit overwhelming. In this guide, I’m going to help you build your first bot on SAP Conversational AI. You’ll need an account to follow this tutorial, click here if you don’t already have one… it’s completely free! Understand that the user is asking for a joke, and send one picked randomly from a list. Understand at least two reactions: Laughs or grins, and react with a funny gif or deep apologies. Deploy our bot on Facebook Messenger. To begin, create an account on SAP Conversational AI website! It’s free. Once you’re logged in, it’s time to create your first bot. Click on the button “Start with a template”, or just on + NEW BOT in the header section. You can choose one or many predefined skills for you bot. This will help you get started faster. Just select “Greetings” for now, but I encourage you to check the others later. You can set up to 6 topics to improve your bot training. Topics are keywords that can define your bot like “fashion”, “games” or “jobs”. Depending on the use of the data, choose the appropriate Data Policy option. Note that we don’t allow “Health” bots (which ask some health personal information to your users) for the moment. For today, we’ll skip the “Code” part, because we won’t need any external information. If you want to connect your bot with some code, I encourage you to check out this tutorial. are all different, but they all ask the same question that we can can sum up as: Are you a bot? Well, that would make a great intent! If your bot is able to recognize this question, you can prepare a smart reaction, like “I’m a robot and I’m proud of it“. All bots should understand basic things such as ‘greetings’, ‘agree’, ‘disagree’, or when a user asks for help. 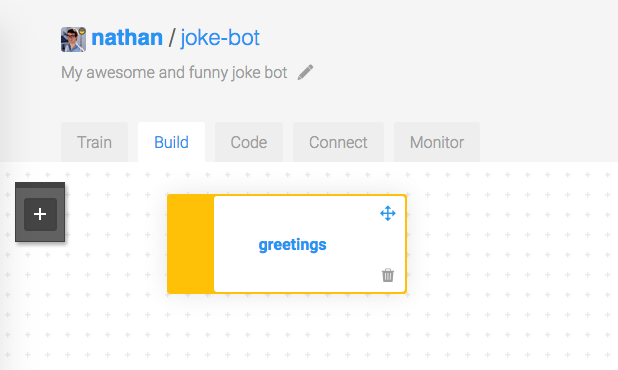 If you chose the predefined Skill “Greetings” when you setup your bot, you will already have two intents: goodbye and greetings. As SAP Conversational AI is collaborative, you do not have to recreate each intent every time! You can ‘fork’ an intent someone already created to clone it right into your bot. Since we need to understand that our user wants to be told a joke, let’s find if the community has already created this intent for us. 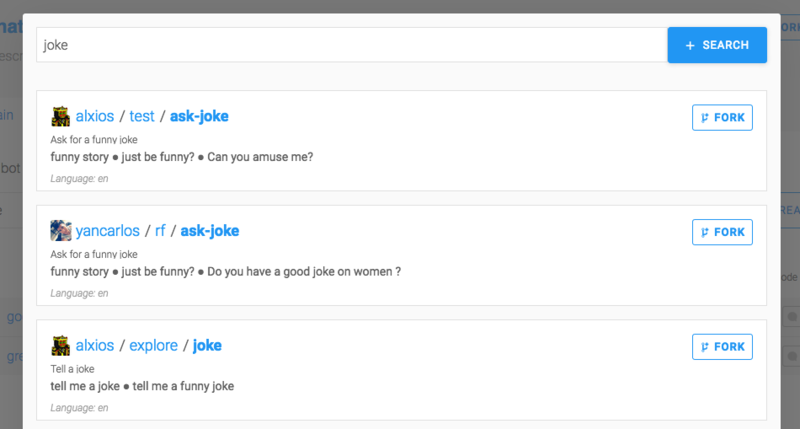 Type “joke” in the input Search. You can click on the intention names if you want to check their full content. The first result will work just fine for me. The results of the search, the fork is just one click away! A golden rule would be to add at least 30 expressions to an intent, and ideally more than 50. Tip: Click on the message “You have X expressions suggested to enrich your intent” to see examples of phrases you can add to your bot. A good way to speed up your training! Regarding what you wrote, you will see which intent was detected under “He’s referring to”. If the algorithm did not detect an intent, or detected an invalid intent, that means that you need to train your bot with more expressions. Go back to your intents, and add or modify expressions. Then, test again. This might sounds a bit repetitive, but it’s the best way to ensure that your bot will detect correctly the users’ sentences. 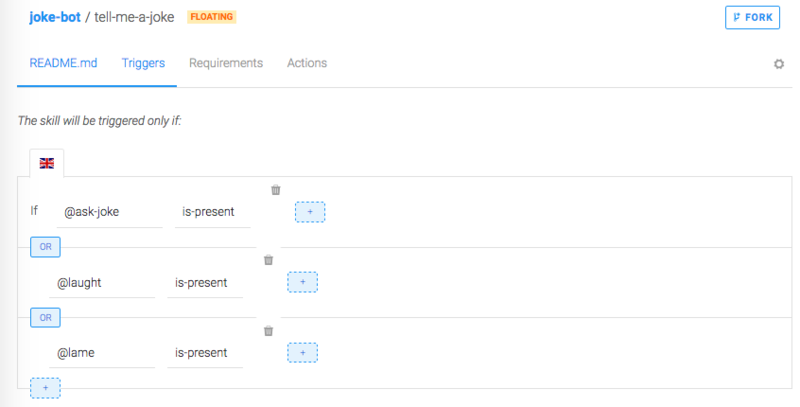 Fallback skills trigger when no other skill has their Triggers fulfilled after a user message. Most of the time, you’ll have only one of this kind, where you can remind the user what your bot can do, and ask them to rephrase. Click on your newly created skill, then go to the Triggers tab. We want to activate our skill if one of the three intentions we created are matched. Don’t forget to change the condition to OR – by clicking on one of the blue buttons “AND” – since it is an AND condition by default, and we want to activate our skill when any of these intentions are matched. 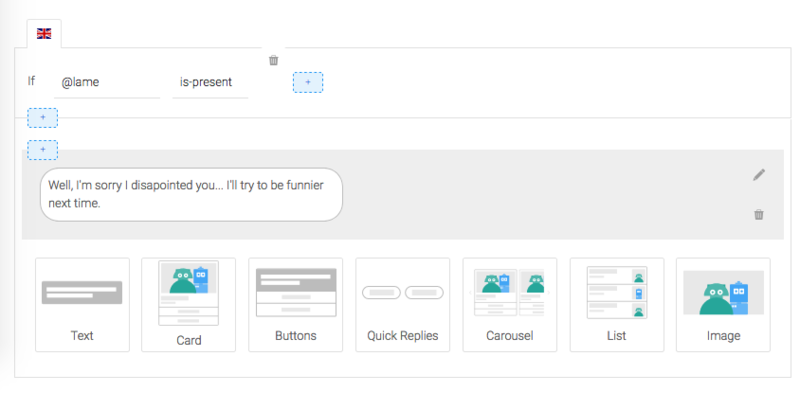 Click on ADD NEW MESSAGE GROUP, then ADD CONDITION to trigger messages and add the condition:If @ask-joke is-present. The “@” stands for intent type. We’ll cover other types later. You can also set a delay (optional) between two messages, up top 5 seconds. This might be useful when the messages your bot sends are quite long and need time to be read by the user. Click on the little + over your message to add a new message to your random list, so that we don’t always send the same joke. If you click again on SEND MESSAGE below, you can send multiple messages at the same time. Here are the urls of my awesome gifs if you want to use them: 1, 2 and 3. Last step before releasing your bot to your audience : chat with it in real situation. This will show you exactly how the bot is and reacts as if you were in the shoes of any other user, and you’ll be able to double check any error in the conversation flow (bad answers, fallback error, weird behavior,…) and correct it before it goes public. In fact, I recommend you chating with you bot as often as you can during its building as it will be easier to identify where an eventual mistake comes from. We will come across the best way to debug your chatbot in a dedicated article. Your bot’s ready? It’s time to deploy it to a public messaging platform. Go to the Connect tab, choose the messaging platform you prefer and follow the step-by-step instructions. You won’t have anything else to do other than the initial configuration to deploy your bot to a new channel. For this reason, you should not hesitate to configure multiples to broaden your audience! Beware that some platforms are not as powerful as others. For example, Telegram is very easy to configure but does not support GIF images, so you should adapt your bot accordingly. If you don’t know where to start, Facebook Messenger is a very powerful platform with a large audience. Now, go on Messenger, Kik, or any other channel you chose and look for you bot, it’s there, it’s live! Hope you enjoyed this tutorial and feel ready to make the internet a bit more conversational! And remember you’re very welcome to contact us if you need help, trough the comment section below or via Slack.